These 10mm Auto cartridges deliver reliable training performance for your handguns. 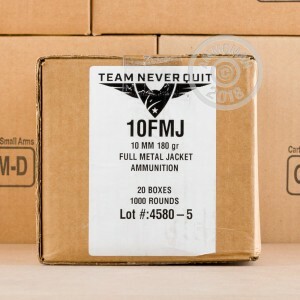 Each round in this box of 50 fires a heavy 180 grain full metal jacket bullet and delivers on this caliber's reputation for excellent accuracy. 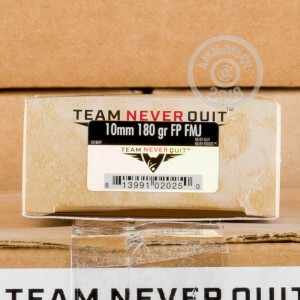 Team Never Quit ammunition is the product of a collaboration between decorated Navy SEAL vet and firearms expert Marcus Luttrell and top ammo manufacturers including PNW Arms and Snake River Shooting Products. It is made in the USA and uses non-corrosive Boxer primers and brass cases. A portion of the profits from TNQ pays for wounded veteran support services. 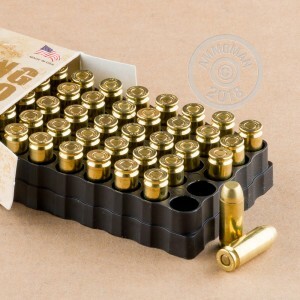 Get free shipping on this or any other ammunition with any order over $99 from AmmoMan.com!